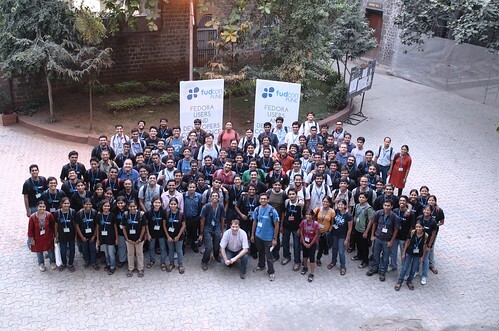 FUDCon was sheduled on 4-6 Nov’11 in COEP, Pune. Because of my other commitments I did not get the chance to attend keynotes or closing talks but I watched some of them online. I did get chance to attend few sessions which were scheduled after my talks. I subumitted two talks and both were got selected. I was hoping that I would finish the my slides well before the schedued date. I have already given “Debugging Kernel OOPs” ealrier for GEEP some time back so I did not to worry about that. For my other talk on Btrfs I started prepraring few weeks back but was not able to prepare slides as expected. Its only a week before theschduled date I started the prepare the slides and demo. I haven’t use Btrfs myself earlier but because of earlier ZFS experinece I was able to pick is up quickly. At KQ Infotech(Now STEC) we ported ZFS on Linux. Both my talks started on time and went as planned. Around 25-30 participants attended the each talk. Debugging Kernel OOPs attended by most of the students while Btrfs session was attended more working professionals. In OOPs session I showed how typical OOPs looks like and what information to look. Then I talked about symbol table and how it is generated. I had two character driver which generates OOPs when read is done on that attached character device. We looked at the OOPs messages to see the stack trace and used “objdump” to look at the”.ko” file. Then at the end we looked at the “.c” file to indentify the root cause. In the Btrfs session I talked about the filesystem and volume manager. What is missing in the existing file-systems in Linux. Then we discussed Rodeh’sresearch on Btrees and how Btrfs leveraged them. We then discussed Btrfs design and its data structures in short. I then showed Btrfs Demo, which I was not able to finish because of time constaints. In between the session lots of interesting questions were asked by the participants. I hope I was able to answer them. On the second day we had few group photos and then the FUDPub. We had lot of fun there. Events like this are always great place meet old friends, colleagues and make new friends. Most of the FUDCon organizing team-members are ex-colleagues of Red Hat. They did a great job of organizing the event. Everyone went an extra mile to make this event successful. I have learned few things, shared some knowledge and met the fellow Fedora community members. What else I can ask for. Kudos to FUDCon organizing team members and all volunteer from COEP. As Jared rightly said in one of its talk that “talks doesn’t cook rice”, I am currently discussing some project idea on Btrfs with college students. If all goes well we should be to fix few bugs on Btrfs or add a new feature.